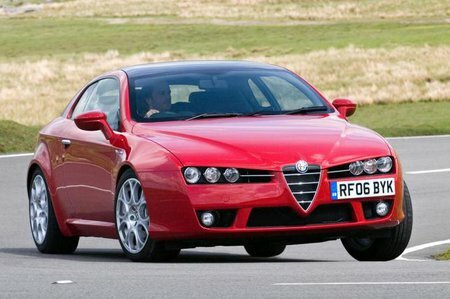 What's the used Alfa Romeo Brera coupe like? The Alfa Romeo Brera has sharp steering that guides you accurately through bends. However, it's no sports car because there's too much body lean. Push hard and the front tyres wash wide – especially in heavier, V6-engined versions. On the other hand, the four-wheel-drive system on the V6 allows more secure acceleration on greasy roads. The Brera is quite forgiving over patchy surfaces, but it tends to lurch over larger humps and shudder over potholes. The interior appears to be built from high quality materials, however, Alfa Romeo's performance in recent reliability and customer satisfaction surveys has been disappointing. Legroom is fine, but even drivers of average height are likely to end up with a crick in their neck, because the seat is too high – even in its lowest setting – and the panoramic glass roof steals even more space. Smaller drivers will struggle to find a comfortable balance of adjustment between the seat, steering wheel and pedals. Although the Brera has four seats, you'd need a detachable head and arms to make yourself comfortable in the back. The boot provides a space for a weekend's luggage, but there's a hip-high lip, which you'll have to haul your bags over.